Ducted heating and Melbourne. A pair that belongs together. One must admit that there’s nothing more Melbourne than getting home after long winter’s day or a chilly night out and rushing to turn on the ducted heating. When it comes heating solutions, ducted heating reigns supreme. Besides creating a warm oasis away from Melbourne’s sometimes harsh elements, ducted heating also comes with some surprising benefits. 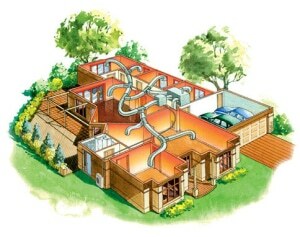 Ducted heating is both an efficient and cost effective way to keep warm. Plus, technology like flexible zoning options mean that you can temperature control each room or choose which rooms to keep warm. You end up saving in the long run (to holiday in the warmer, more exotic lands). Ducted heating is also low on CO2 emissions, so you can keep warm without feeling guilty about your carbon footprint. Since most ducted heating systems are either fitted underneath the floor or along the ceiling, they don’t take up valuable space or compromise the look of your home. Stress less, your Ikea investments will not be overshadowed. It’s easy to assume that once ducted heating systems are installed, they’re hard to access. However, this is not the case. Your ducted heating system can be serviced and repaired easily, ensuring that your unit is always running at peak efficiency. Do you have more questions about ducted heating? Whether you need help finding the right ducted heating system for you, your system needs to be repaired or serviced or you’d like to know more about how ducted heating works, we’re eager to hear from you. Contact us today on (03) 9310 1990 or visit us at https://www.advancehc.com.au.